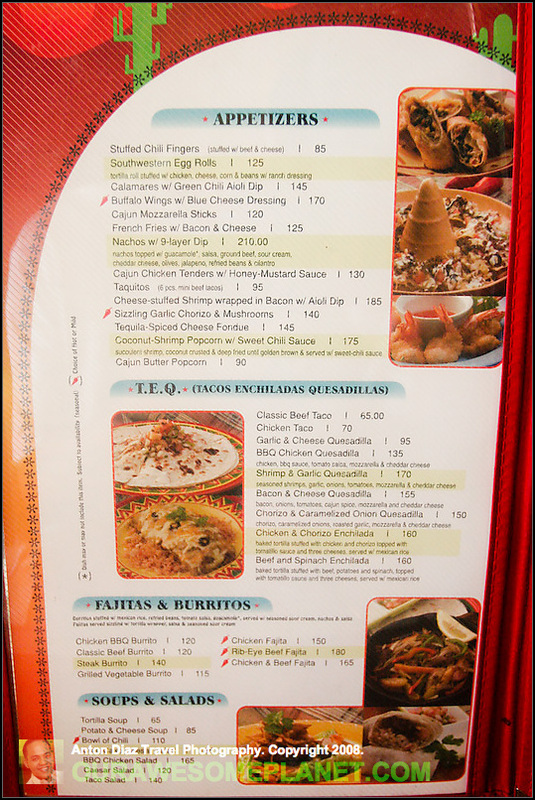 Note: This restaurant is closed already and moved to Katipunan Ave.
Taquitos (P95). 6 pieces mini-tacos. I miss eating in a good Mexican restaurant like Zapata in Angeles. So far, the best Mexican food in Manila is hidden in the alfresco restaurants of Robinson’s Pioneer. 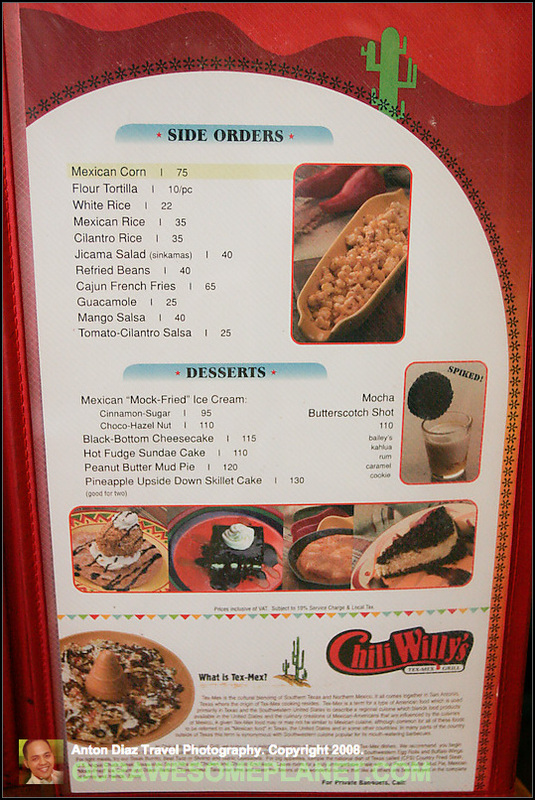 The name of the Tex-Mex restaurant is called Chili Willy’s. 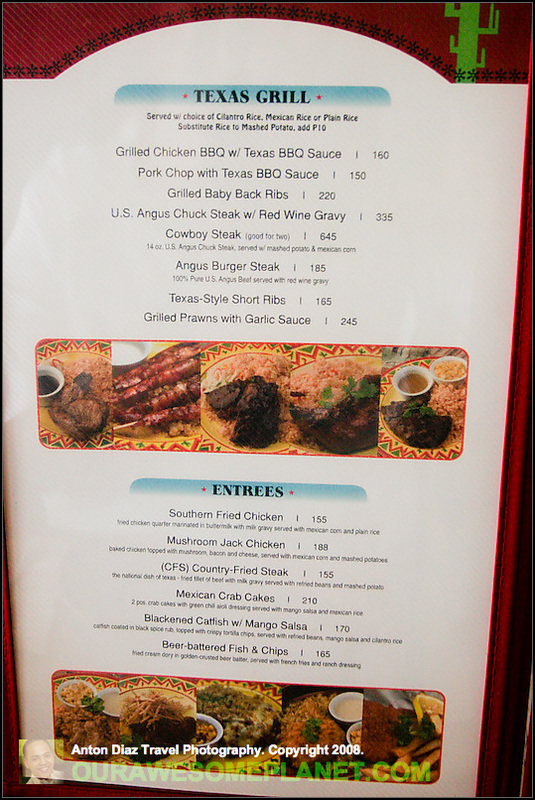 It serves Tex-Mex cuisine which is a cultural blending of Southern Texas and Northern Mexico usually found in San Antonio, Texas. Just think of it as Fajitas and Burritos meet Steaks and Burgers. This is the best restaurant in Robinson’s Pioneer. (Actually, I was surprised to find one in this mall.) So if you have friends working in Robinson’s offices in Pioneer (like Summit Media or Accenture), ask them to have lunch or dinner with you at Chili Willy’s. 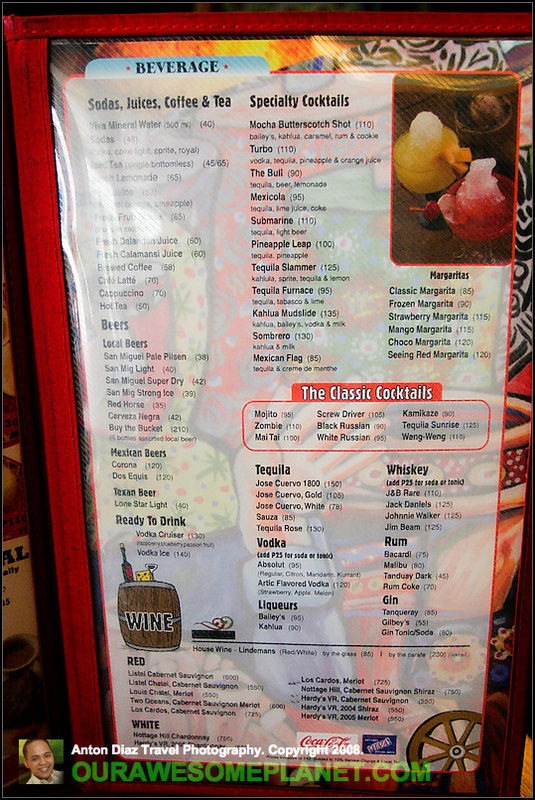 Appetizers, Tacos Enchiladas Quesadillas, Fajitas & Burritos, Soups & Salads. Blackened Catfish with Mango Salsa (P 170). Catfish coated in black spice rub, topped with crispy tortilla chips, served with refried beans, mango salsa and cilantro rice. One of the interesting and unique dish that I would recommend is this Blackened Catfish. I like the peppery spice of the catfish complemented by the cilantro rice. Don’t forget to order the ice cream dessert. The ice cream is wrapped in tiny bits of peanuts and set on top of fried tortilla with a yummy layer of nutella. i’ve always had a hard time finding GOOD mexican food here in manila. there was a small burrito stall in pilar village, las pinas back during my college days that had the BEST burritos, but unfortunately, they’re not around anymore. I agree with your review – thanks for putting this little gem of a restaurant in the spotlight – I work in the area and getting more foot traffic to this place will keep it alive! 🙂 Oh, try the upside-down pineapple cake – totally underrated – I end up eating one (well, I try my best to share with my wife when she visits). Pahabol – the steaks are pretty darn good too. They’re pretty tiny (roughly 4 oz – cooked) but they’re tasty and you can’t beat the prices! I dunno — tried this place once, I recall I didn’t like it. Maybe worth another visit. This is Tricia, I spoke with you when you visited our store Chili Willy’s. What can I say? This is an awesome blog! Thank you! May I have your contact details? I wanna send you a gift. Please email me at [email protected]. Hope to hear from you. Cheers! looks promising… i’m craving this now… can’t wait to try it… esp the ice cream… i love nutella!!! hey anton! thanks for the tip! we tried it last saturday and it was damn awesome! i looove it. i ordered the usa angus burger steak with chicken taco.. its heavenly man! 🙂 cant wait for your next adventure! wow, an alternative to chili’s. was in the US last May with my wife and I had my fill of chili’s over there. hope to try it out sometime. Servings were small for me. I tried Chicken jack something and it tasted ordinary. The Tel number is actually +632 6874218 , pls kindly correct 🙂 but its great you posted it here Anton since they don’t have a PLDT listing and I tried the number combo you gave to order take out. Thanks for this Anton! You’re a Craving Saver! hi anton! thanks for posting this fine resto, my bf has been craving for good mexican food. everything looks and sounds good! i already made our reservation just now and we will try tonight! Thanks again! MY family tried it Sunday night. I was really excited to try this place. But unfortunately, it wasn’t good. The shrimp wrapped in bacon tasted old. The chili tasted like picadillo. The US Chuck steak was so thin. The beer battered fish was not good either. The enchilada was a bit too salty. The short ribs was ok. They were out of catfish and baby back ribs eventhough we were the only one’s dining in the resto. The buffalo wings didn’t have the chili sauce or the sauce that makes it buffalo wings; it was just deep fried wings drenched in flour. We had to get burgers from Brothers just to get rid of the bad experience. Tried eating here too. To put it simply, the presentation and serving size were good. But the taste? Meh. Talaga? thanks for sharing, not sure why they moved to a new place… Saan kaya sila lumipat? I grew up in california with latino friends and now i’m here in manila…I love mexican food…im having hard time looking for good mexican rest….i’m going to try this place.. I remember that burrito stall! It was really good! 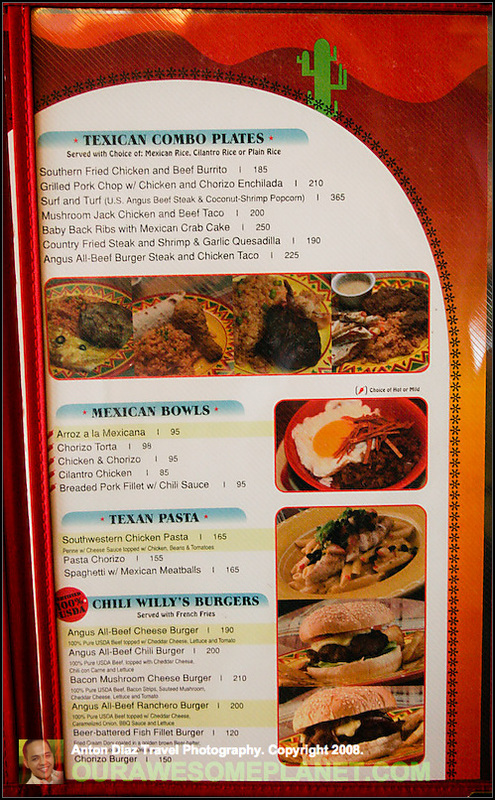 My favorite Tex Mex restaurant in Manila was Cactus Jacks but it closed in 2007. I really miss it! I’m a Mexican food junkie! I’m stop by Chili Willy’s this week and give it a try.